Born and raised in Logan, Utah, Marriner Eccles was just 22-years old when the sudden death of his father in 1912 left him to care for his mother, eight younger siblings, and the family’s vast business interests. Eccles succeeded on all fronts, ultimately coming to run much of his father’s business empire, and creating the First Security Corporation multi-state banking company in 1928. At the time of the nation’s financial crash of 1929 and the Great Depression, his keen mind and nerves of steel staved off financial disaster, with no depositor at any Eccles-led bank losing even one penny. Called upon by U.S. President Franklin D. Roosevelt to serve as Chairman of the Federal Reserve (1934–48), Eccles crafted the nation’s monetary policy and many keystones of the U.S. financial system that remain today, including a dramatically reformed Federal Reserve System, the Federal Deposit Insurance Corporation (FDIC), and the Federal Housing Act (FHA). In 1944, just before the end of World War II, Eccles helped craft agreements at the historic Bretton Woods Conference that created the World Bank and the International Monetary Fund (IMF). He remained on the Federal Reserve Board until 1951. Eccles continued to advise the Federal government with his independent thought, wisdom, and foresight until his death in 1977 at age 87. The Federal Reserve Building in Washington, D.C. was named in his honor in 1982. 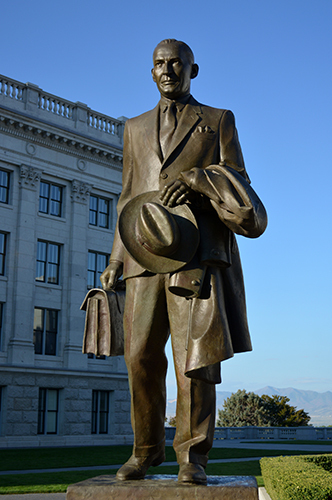 Utah artist Mark DeGraffenried sculpted the bronze statue, the most recent addition to the North Plaza.